I’m a sucker for an epic story in any form. A book, a movie, a TV series, even the occasional epic poem. It really doesn’t matter. I’m also a late bloomer, one who discovers the stuff of life late, but probably enjoys the stuff I discover more because it’s on my own time, without necessarily being part of a crowd or trend. That convergence has hit me once again, at the ripe old age of forty-two, in the form of the revisioned series Battlestar Galactica (2003, 2004-09). I had planned to watch the original miniseries for this drama when it came out in December ’03, but with so many things outside the realm of then newborn baby Noah, writing and work that year, my watching Battlestar Galactica fell to the side. I already had a lineup of shows to watch — Six Feet Under, Queer As Folk, Law & Order, CSI. I didn’t need a new thing on my screen, especially something that was based on such an old and goofy series from the ’70s with Lorne Greene, Dirk Benedict and Richard Hatch. “What are they gonna do next, redo BJ & The Bear?,” I said to my wife when I first heard about the Battlestar Galactica miniseries in September ’03. 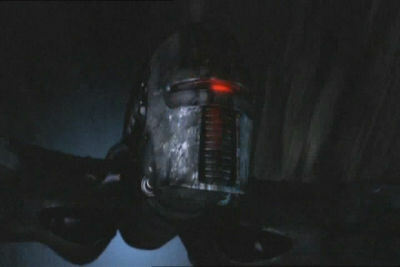 Cylon Raider Scar screen shot, September 16, 2009. (Skier Dude via Wikipedia). Qualifies as fair use under US Copyright laws due to image’s poor resolution. asleep about three hours, to my wife dosing off to the TV in our bedroom. I woke up to the sight of Cylon Raiders in flight, to a strange scientist seeing visions of either a skinny angel or his dead Cylon girlfriend, and Edward James Olmos playing the mercurial Commander Adama. I could tell in ten minutes that this series was way different from the Battlestar Galactica series of my ’70s youth. 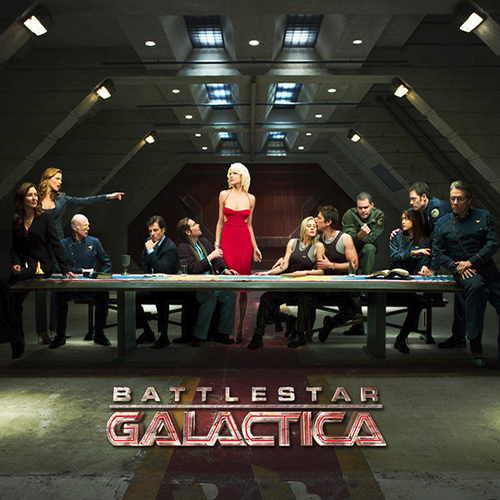 The miniseries was on BBC America, so I watched it until 5 am, and then discovered that they had skipped two full seasons ahead to a random Battlestar Galactica episode. I was fully awake by then, so I went on Netflix to find the entire Battlestar Galactica series available on streaming video. I watched season one that day, and season two Easter Sunday and that Monday. In fact, I watched all four seasons of Battlestar Galactica in six days. I found the story engrossing, the acting intense, and the series an in-depth exploration of the worst features of the human condition under the most difficult of stresses and circumstances. It was so unlike the original series that after a few episodes, I didn’t even think about the differences anymore. The story of a flawed, destructive race of humans fighting each other while fighting for their survival against their more destructive yet more rational creations. I couldn’t help but fall in love with the series. After that week, I finally read and watched the reviews and the comments about the series. They fell into two categories. There were plenty of folks who refused to watch the new Battlestar Galactica on principle. They saw the recasting of Starbuck as a woman an insult, the ability to make Cylons as human-esque machines blasphemy, and the revisioning of these humans as ones with many of our worst features multipled by a factor of ancient Greece, Rome and Persia an abomination. Oh well! I never liked the original series, with its idealized version of humanity, with its archetype good and evil characters, and with its goofy atmosphere in the midst of potential extinction, the ultimate epic crisis (“All Along The Watchtower” notwithstanding). The other group was just like me. Fascinated by the lengths to which the producers and writers for the show went to present humanity at its most monstrous, between violence, selfishness, lust, greed, avarice and strive. Mesmerized by the cast’s ability to explore our worst and deepest fears, to hold out hope against hope, to take us into the depths of despair again and again. 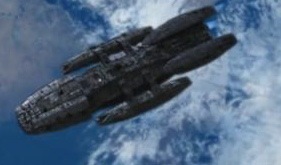 The battle-scarred Battlestar Galactica finally reaches Earth (orbiting over the horn of Africa, March 21, 2009. (http://graphic-engine.swarthmore.edu). I had to watch Battlestar Galactica a second time, this time more slowly and deliberately. So, through the second half of April and first half of May, I watched again, to find something remarkable. Despite their deep flaws, many scars and scabs, and twisted minds, there was something noble and redeemable about these humans, about the Cylons. Even the fact that the Cylons were a human creation didn’t matter. And to top that all off with a divine hand, a guiding force as the prime mover for the 50,000 humans that survived the nuclear annihilation of their twelve planets by the Cylons. That really is an epic journey. One that heals as much as it scars. The story of my life the past thirty years, not to mention a reference in three of my posts over the past month. A commentary on the state of humanity in the early twenty-first century. What more can a late-bloomer ask for?